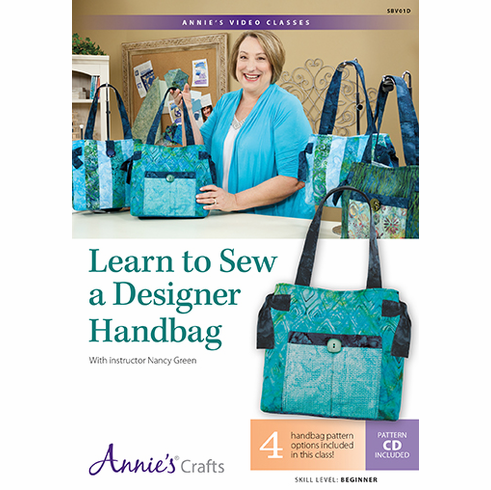 DVD Video Class - includes pattern for making this handbag! Great for beginners and experts alike - detailed video teaches bag making techniques including: supplies, interfacings, fusing, how to apply a magnetic purse snap, pockets, bag ties and straps! Make with the large or the medium size handbag with options for pockets and strips on the bag front. Includes two discs - DVD with a 3 hour video class, CD with the pdf to print out the 9 page pattern. You will have to print the pattern on your printer. The DVD video class can be viewed on your computer or loaded to your handheld devices.